Issued 25 Board administrative procedures. Established the administrative and Secretarial Support Office, which had provided support in two shifts seven days a week, unless otherwise required, with some additional third-shift support. Established the Photographic Data Control Center to correlate and distribute photographs and maintain a film library. Processed letters, telegrams, and telephone messages received offering assistance, recommendations, and comments. Periodically issued approved schedules of work. Established the Audio Magnetic Tape Library to control 0.64centimeter voice-transmission tape recordings about spacecraft 012 during the Space Vehicle Plugs-Out Integrated Test. "Board Proceedings" and Append. D. "Panels 12 thru 17," Report of Apollo 204 Review Board , pp. 3-29 and D-15-3 through D-15-5. The Apollo 204 Review Board accepted the final report of the Fracture Areas Panel (No. 10). The panel had been charged with inspecting spacecraft 012 for structural failures in the January 27 fire and analyzing them from the standpoint of local pressure, temperature levels, direction of gas flow, etc. The panel inspected the spacecraft structures while they were still at Launch Complex 34 and continued through removal of the CM heatshield. Structural damage reports were made coinciding with spacecraft disassembly phases. As major subsystems were removed from the spacecraft they were visually inspected. Buckles, fractures, cracks, melted areas, localized arcing or pitting in metal components, and obvious direct wire shorts were noted and documented. Spacecraft data during the Plugs-Out Test gave indications from which a spacecraft pressure history could be estimated. The CM cabin structure had ruptured at 6:31:19.4 (±0.1) p.m. EST January 27 at an estimated minimum cabin pressure of 20 newtons per sq cm (29 psia). The CM cabin structure had sustained cabin pressure in excess of its designed ultimate pressure of 8.9 newtons-per-sq-cm (12.9-psi) differential (19 newtons per sq cm; 27.6 psia). Cabin pressure at rupture probably reached 20 to 26 newtons per sq cm (29 to 37.7 psia). The estimated average gas temperature at rupture exceeded 644 kelvins (700 degrees F). The CM cabin ruptured in the aft bulkhead adjacent to its juncture with the aft sidewall. The failure occurred because of excessive meridional tensile stress in the inner face sheet at the junction of the weld land to the thinner face sheet. The fracture originated on the right-hand side of the command module. The CM cabin structure was penetrated in the aft bulkhead beneath the environmental control unit and the aft sidewall. The loss of structural integrity at these penetrations occurred after the primary rupture. Failure of the water glycol and oxygen lines near the environmental control unit resulted in local burning and melting of the adjacent structure. The aft heatshield stainless-steel face sheets were melted and eroded. The temperature of the flame and gas exiting from the fracture origin exceeded 1640 K (2500 degrees F). "Board Proceedings" and Append. D, "Panels 6 thru 10," Report of Apollo Review Board , pp. 3-30 and D-10-3 through D-10-7. The final report of the Spacecraft and Ground Support Equipment Configuration Panel (No. 1) was accepted by the Apollo 204 Review Board. The panel had been assigned the task of documenting the physical configuration of the spacecraft and ground support equipment immediately before and during the January 27 fire, including equipment, switch position, and nonflight items in the cockpit. The panel was also to document differences from the expected launch configuration and configurations used in previous testing (such as altitude-chamber testing). An engineering order, released at North American Aviation's Downey facility on January 20, provided direction to inspect the polyurethane foam in specified areas and coat the silicone rubber to meet flammability requirements. The direction was not recorded in the configuration verification record as of the start of the Space Vehicle Plugs-Out Integrated Test and was not accomplished on spacecraft 012. This item was considered as possibly significant in terms of fuel for the fire and a medium for flame propagation. Polyethylene bags covered the hose fitting for the drinking water dispenser and the battery-instrumentation cable and connectors and transducer, which were placed on the aft bulkhead near the batteries. The bags were made of nonflight materials. Two polyurethane pads, covered with Velostat, were stowed over couch struts. The pads were placed in the spacecraft to protect the struts, wiring, and aft bulkhead during the planned emergency egress at the end of the test. These items were of nonflight material and were not documented by quality inspection records. Three packages of switching checklists from the Operational Checkout Procedure and one package of system malfunction procedures, in a manila folder, were stowed on the crew couches and on a shelf. These items were on unqualified paper and, while required for the test, they were not documented by quality inspection records. Nylon protective sleeves were covering all three crewmen's oxygen umbilicals. These sleeves were nonflight items. Three ground-support-equipment window covers had been temporarily installed to protect the windows and were nonflight items in the spacecraft at the time of the accident. Another such cover for the side hatch window was removed by the crew and stowed inside the command module. These covers were of nylon fabric; flight covers were made of aluminized Mylar. Velcro pile had been installed to protect the Velcro hood on the command module floor. It would have been removed before the flight. "Remove before flight" streamers installed in the command module interior were additional nonflight items. Polyethylene zipper tubing, installed to protect hand controller cables, was a nonflight item and was additional material in the command module. Eighty engineering orders effective for spacecraft 012 had not been carried out at the time of the accident. Of these, twenty were specified to be completed after the test; four did not affect configuration. Test requirements had no defined relationships with the open status of 56 engineering orders. The reason not all work items and engineering orders were closed was late receipt of changes or further work scheduled to be completed before launch. Items not documented by quality inspection records had been placed on board the spacecraft during preparation for the Space Vehicle Plugs- Out Integrated Test. Procedures for controlling entry of items into the spacecraft were not strictly enforced. "Board Proceedings" and Append. D, "Panels I thru 4," Report of Apollo 204 Review Board , pp. 3-30 and D-1-5 through D-1-19. The Apollo 204 Review Board accepted the final report of the Security Operations Panel (No. 14). The panel had been assigned to review existing security practices at KSC and supporting areas for adequacy and recommend any needed changes. Practices included access control, personnel sign-in requirements, buddy systems, and background investigation requirements. KSC security personnel or uniformed security personnel had been assigned to all locations requiring safeguarding measures, including launch vehicle stages and spacecraft from the time of arrival at KSC until the time of the January 27 accident. The number of KSC and uniformed security personnel members used was adequate. the contractor control and log command module ingress and egress. the command module ingress-egress log was inadequately maintained. "Board Proceedings" and Append. D,"Panels 12 thru 17," Report of Apollo 204 Review Board , pp. 3-30 and D-14-3 through D-14-7. The Apollo 204 Review Board accepted the final report of its Origin and Propagation of Fire Panel (No. 5). The panel task had been to "conduct inspections, chemical analyses [and] spectrographic analysis of spacecraft, parts or rubble, or use any other useful techniques to establish point of [the CM 012] fire origin, direction and rate of propagation, temperature gradients and extremes. The nature of the fire, the type of materials consumed, the degree of combustion shall be determined." Severe damage to wiring was found at the bottom of the power equipment bay along the aft bulkhead. Evidence of arcing was found and damage was less severe in the right-hand direction of this bay. Electrical arcing in the extreme lower left-hand comer of this bay could have provided a primary ignition source. Right-hand portions of the left-hand equipment bay were severely damaged. Wiring, tubing, and components in the carbon dioxide absorber compartment and oxygen/water panel compartment were burned and melted. Penetrations in the aft bulkhead and pressure vessel wall were observed. 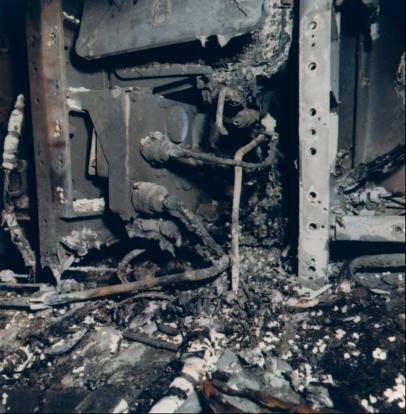 The carbon dioxide absorber compartment showed heavy fire damage; failure was due to pressure overload and melting caused by the fire in this area. Electrical arcing in the right-hand portion of this bay could have provided a primary ignition source. Evidence of electrical arcs from conductor to conductor and from conductor to structure were found. No arc could be positively identified as the unique ignition source. Three were found that had all the elements needed to cause the disaster. Two of these showed evidence of poor engineering and installation. "Board Proceedings" and Append. D, "Panel 5," Report of Apollo 204 Review Board , pp. 3-30 and D-5-3 through D-5-15. The final report of the Ground Emergency Provisions Panel (Panel 13) accepted by the Apollo 204 Review Board submitted 14 findings and determinations. The panel had been charged with reviewing the adequacy of planned ground procedures for the January 27 spacecraft 012 manned test, as well as determining whether emergency procedures existed for all appropriate activities. The review was to concentrate on activity at the launch site and to include recommendations for changes or new emergency procedures if deemed necessary. the emergency training of the flight crew and checkout test team. Second, the panel reviewed the methods used to identify hazards and ensure adequate documentation of safety procedures and applicable emergency instructions in the operational test procedures. The applicable test documents and flight crew procedures for the AS- 204 Space Vehicle Plugs-Out Integrated Test did not include safety considerations, emergency procedures, or emergency equipment requirements relative to the possibility of an internal spacecraft fire during the operation. The absence of any significant emergency preplanning indicated that the test configuration (pressurized 100-percent-oxygen cabin atmosphere) was not classified as potentially hazardous. The propagation rate of the fire in the accident was extremely rapid. Removal of the three spacecraft hatches, from either the inside or the outside, for emergency exit required a minimum of 40 to 70 seconds, respectively, under ideal conditions. Considering the rapid propagation of the fire and the time constraints imposed by the spacecraft hatch configuration, it is doubtful that any amount of emergency preparation would have precluded injury to the crew before egress. Procedures for unaided egress from the spacecraft were documented and available. The AS-204 flight crew had participated in a total of eight egress exercises employing those procedures. The 204 flight crew was familiar with and well trained in the documented emergency crew procedures for effecting unaided egress. The spacecraft pad work team on duty at the time of the accident had not been given emergency training drills for combating fires in or around the spacecraft or for emergency crew egress. They were trained and equipped only for a normal hatch removal operation. The spacecraft pad work team was not properly trained or equipped to effect an efficient rescue operation under the conditions resulting from the fire. Frequent interruptions and failures had been experienced in the overall communications system during the operations preceding the accident. At the time the accident occurred, the status of the system was still under assessment. The status of the overall communications was marginal for the support of a normal operation. It could not be assessed as adequate in the presence of an emergency condition. Emergency equipment provided at the spacecraft work levels consisted of portable carbon dioxide fire extinguishers, rocket-propellant-fuel-handler's gas masks, and 4.4-centimeter-diameter fire hoses. The existing emergency equipment was not adequate to cope with the conditions of the fire. Suitable breathing apparatus, additional portable carbon dioxide fire extinguishers, direct personnel evacuation routes, and smoke removal ventilation were significant items that would have improved the reaction capability of the personnel. Under the existing method of test procedure processing at KSC, the safety offices reviewed only the procedures noted in the operational checkout procedure outline as involving hazards. Official approval by KSC and Air Force Eastern Test Range Safety was given after the procedure was published and released. The scope of contractor and KSC Safety Office participation in test procedure development was loosely defined and poorly documented. Post-procedure-release approval by the KSC Safety Office did not ensure positive and timely coordination of all safety considerations. "Board Proceedings"; Append. A, "Board Minutes"; and Append. D, "Panels 12 thru 17," in Report of Apollo 204 Review Board , pp. 3-28 through 3-30, A-1 12, and D-13-3 through D-13-13. "Assemble, summarize, compare and interpret requirements and data describing the flammability of nonmetallic materials exposed to the crew bay environment of the spacecraft and in related applications. "Specify and authorize performance of tests and/or analyses to furnish additional information as to flammability characteristics of these materials alone, and in combination with fluids known or postulated to have been in the spacecraft 012 cabin. "Panel No. 8, in support of Panel No. 5 (Origin and Propagation of Fire) shall interpret and implement the requirements for analyses of debris removed from the spacecraft." Complete documentation identifying potentially combustible nonmetallic materials in spacecraft 012 was not available in a single readily usable format. A total of 2,528 different potentially combustible nonmetallic materials that were probably used on spacecraft 012 was found by a review of available documentation. The program for identifying and documenting nonmetallic materials used in the spacecraft, including their weights and surface areas, was not adequate. Raschel Knit, Velcro, Trilock, and polyurethane foams burn about twice as fast (in the downward direction) in oxygen at a pressure of 11.4 newtons per sq cm (16.5 psia) as at 3.5 newtons per sq cm (5 psia). The primary fuels for the fire burned more than twice as fast in the early stages of the spacecraft 012 fire in accident conditions (pressure of 11.4 newtons per sq cm) as in the space flight atmosphere for which they were evaluated (3.5 newtons per sq cm). Surface and bulk damage of materials in spacecraft 012 varied from melting and blistering of aluminum alloys, combustion of Velcro, and burning of Teflon wire insulation to slight surface damage and melting of nylon fabrics. The fire filled the spacecraft interior. The most intense heat was in the lower left front area around the environmental control unit. Surface temperatures in excess of 800 kelvins (1,000 degrees F) were reached in areas such as the front and left side of the spacecraft. Surface temperatures were less than 500 K (400 degrees F) in isolated pockets above the right-hand couch. The rate of flame propagation, the rate of pressure increase, the maximum pressures achieved, and the extent of conflagration in 3.5 newtons-per-sq-cm (5-psia) oxygen boilerplate tests was much less severe than observed in the 11.4-newton (16.5-psia) oxygen boilerplate tests. Burning or charring was limited to approximately 29 percent of the nonmetallic materials by oxygen depletion. The conflagration that occurred in spacecraft 012 at a pressure of 11.4 newtons per sq cm would be far less severe and slower in a spacecraft operating with an oxygen environment at 3.5 newtons, if additional large quantities of oxygen are not fed into the fire. North American Aviation materials selection specification requires that a material pass only a 500 K (400 degrees F) spark-ignition test in oxygen at 10.1 newtons per sq cm (14.7 psia). NAA criteria for materials flammability control were inadequate. No flammability criteria or control existed covering nonflight items installed in CM 012 for test. Lack of control of nonflight material could have contributed to the fire. The NASA materials selection criteria required that a material pass a 500 K (400 degrees F) spark-ignition test and a 1.27-an-per-sec combustion rate (measured downward in oxygen at 3.5 newtons per sq cm). Raschel Knit and Velcro (hook) pass this test. The NASA criteria for materials flammability were not sufficiently stringent. The system for control of nonmetallic materials use at MSC during the design and development of government furnished equipment used in CM 012 depended on identification of noncompliance with criteria by the development engineers. The NASA materials control system was permissive to the extent that installation or use of flammable materials were not adequately reviewed by a second party. Nonmetallic materials selection criteria used by North American and NASA were not consistent. The NASA criteria, although more stringent, were not contractually imposed on the spacecraft contractor. Materials were evaluated and selected for use in CM 012 using different criteria. Application of the NASA criteria to the command module would have reduced the amount of the more flammable materials (Velcro and Uralane foam). Alternate materials that are nonflammable or significantly less flammable than those used on spacecraft 012 were available for many applications. The amount of combustible material used in command modules can be limited. Current information and displays of the potentially flammable materials configuration of spacecraft 012 were not available before the fire. Maintenance of data and displays at central locations and test sites for management visibility and control of flammable materials is feasible and useful. "Board Proceedings"; Append. A, "Board Minutes"; and Append. D, "Panels 6 thru 10," in Report of Apollo 204 Review Board , pp. 3-30, A-112, and D-8-3 through D-8-35. NASA News Release 67-67, March 20, 1967. Spacecraft 012 command module, its systems, components, and related drawings. Category 1 materials would be stored at LaRC, Category 2 at MSC, and Category 3 at KSC. In other actions Robert W. Van Dolah, Chairman of the Origin and Propagation of Fire Panel, reported on a test being conducted in CM 014 to attempt to establish the amount of static electricity that might be generated by a suited crewman; and members of the Board met with MSC Director Robert R. Gilruth and members of his staff, as well as management and engineering personnel of North American Aviation, for a presentation concerning solder joints in the CM. "Board Proceedings," pp. 3-30, 3-31. Final report of the Disassembly Activities Panel (No. 4) was accepted by the Apollo 204 Review Board. Panel 4 had been assigned to develop procedures for disassembly of spacecraft 012 for inspection and failure analysis. Disassembly was to proceed step by step in a manner permitting maximum information to be obtained without disturbing the evidence - in both the cockpit and the area outside the pressure hull. Cataloging documentary information within the spacecraft and displaying the removed items were a part of the required procedures. Immediately after the January 27 accident, NASA KSC Security placed Launch Complex 34 under additional security. Special guards were assigned to the service structure and to the adjustable level at the entrance of the CM. Controls were established for personnel access to the service structure and the CM. After the accident, before disturbing any items in the spacecraft, a series of photographs was taken. A step-by-step photography method was established as a standard operating procedure for the Disassembly Activities Panel. The first step toward an orderly disassembly was to ensure safe working conditions at the spacecraft. A meeting with KSC and Air Force Eastern Test Range Safety personnel established procedures and safety rules. After the couches were removed, a special false floor was suspended from the couch strut fittings to provide access to the entire inside of the spacecraft without disturbing any evidence. The false floor was fabricated from aluminum angles supporting 2-centimeter-thick, 46-centimeter plexiglass squares. The Review Board appointed a Panel Coordination Committee to carry out new procedures to ensure closely controlled and coordinated equipment removal. Bond room - a bonded area to receive components as they were removed from CM 012. This area was provided with a receiving table; 10 storage cabinets for small components; and areas for large components and items associated with the investigation but not from the command module itself. Astronaut equipment room and work room - an area in which the spacesuits and other government furnished crew equipment were investigated. Bonded display area - an area in which components could be displayed under controlled conditions to permit investigators to examine CM 012 components visually. Command module 012 work area - The command module was placed in a supporting ring within an existing workstand in the PIB and remained in this area until the aft heatshield was removed. The CM was then transferred to a standard support ring in the north end of the building. Technicians continued the disassembly activities while the CM was in these areas. Spacecraft 014 CM - Spacecraft 014 CM (identical in configuration to spacecraft 012) was shipped to KSC on February 1 to assist the Apollo 204 Review Board in the investigation. This CM was placed in the PIB and was used for practicing difficult removals of CM 012 components. Mockup No. 2 - Mockup No. 2, a full-scale plywood command module, was brought to KSC and placed in the PIB February 8. The mockup had been configured with Velcro, debris traps, couch positioning, etc., to duplicate CM 012 configuration at the time of the fire. Half-scale mockup - A half-scale mockup of the CM interior was placed in the bonded display area February 8 to display half-scale interior surface photographs taken after the fire in CM 012. "Board Proceedings," and Append. D, "Panels 1 thru 4," Report of Apollo 204 Review Board , pp. 3-31 and D-4-3 through D-4-8. The Apollo 204 Review Board accepted the final report of its Test Environment Panel (Panel 2). Panel 2 had been assigned responsibility for the history of all test environments encountered by spacecraft 012 that were considered germane to system validation from a fire hazard standpoint, including qualification testing of systems and subsystems. The panel was particularly to emphasize qualification tests in pure oxygen with regard to pressures, temperature, time of exposure, and simulation of equipment malfunctions. It was also to indicate any deficiencies in the test program related to the problem; comparison with previous tests of appropriate flight, house, or boilerplate spacecraft; and documentation of any problems encountered which related to fire hazard. The panel reviewed all tests pertinent to the investigation. The qualification tests were reviewed at MSC, covering more than 1,000 documents. Vehicle tests were reviewed at North American Aviation's Downey, Calif., facility, covering more than 500 documents. Summaries of these efforts were reviewed by the panel at KSC to determine any test program deficiencies. Not all crew compartment equipment had been tested as explosion proof. Testing of possible ignition sources had been insufficient. Some CM equipment exhibited arcing or shorting either during certification or during spacecraft 012 testing. There was no positive way to determine from the records reviewed whether spacecraft anomalies (possibly caused by an arc or a short) were reviewed by system engineers and the test conductor before a test. Review of possible ignition sources before manned testing was inadequate. Not all equipment installed in CM 012 at the time of the accident was intended for flight (some components were installed for test purposes only). The suitability of this equipment in the CM for this test was not established. "Board Proceedings" and Append. D, "Panels 1 thru 4," Report of the Apollo 204 Review Board , pp. 3-32 and D-2-3 through D-2-8. the Apollo Applications missions would be designated sequentially as AAP-1, AAP-2, etc. The number designations would not differentiate between manned and unmanned or uprated Saturn I and Saturn V missions. Designate the next flight Apollo 4, as indicated by Headquarters, but apply the scheme somewhat differently for missions already flown. Specifically, put the Apollo 1 designation on spacecraft 012 and then, for historic purposes, designate 201 as mission 1-a, 202 as mission 2 and 203 as mission 3. A memorandum to the NASA space flight Centers, North American Aviation, and certain Headquarters personnel from the NASA Assistant Administrator for Public Affairs on April 3 stated that the Project Designation Committee had approved the Office of Manned Space Flight's recommendations and that Mueller had begun implementation of the designations. On April 24, OMSF further instructed the Centers that AS-204 would be officially recorded as Apollo 1, "first manned Apollo Saturn flight - failed on ground test." AS-201, AS-202, and AS-203 would not be renumbered in the "Apollo" series, and the next mission would be Apollo 4. TWX, Mueller, NASA OMSF, to KSC, MSFC, MSC, "Apollo and AAP Mission Designation," March 25 and April 24, 1967; ltr., Low to Mueller, March 30, 1967; memo, Julian Scheer, NASA Assistant Administrator for Public Affairs, to distr., April 3, 1967.
the ultimate goal should be to develop a system ready for flight use within six months. Memo for the Record, George M. Low, "Fire detection/extinguishment," March 27, 1967. Apollo 204 Review Board Chairman Floyd Thompson asked for a report on the Pyrotechnic Installation Building activity. Disassembly of spacecraft 012 had been completed March 27. Of 1,261 items logged through the bond room for display to Board and panel personnel, about 1,000 items were from the CM. The final report of the Screening Committee was distributed to the Board by George T. Sasseen, KSC, for review. Sasseen stated that the following items would be retained as Category A (items damaged or identified as suspect or associated with anomalies). Maxime A. Faget, MSC, advised the Board that the lithium hydroxide cartridge had been sent to MSC for analysis. Hubert D. Calahan, OMSF, was appointed courier to handcarry the item to MSC and Richard S. Johnston, MSC, was designated the Board's witness for the analysis. MSC's Crew Systems Laboratory was to make the analysis and report to the Board. The analysis was to identify contaminants to determine the quantity of carbon dioxide in the lithium hydroxide. William D. Mangan, Langley Research Center, joined the legal staff supporting the Board. "Board Proceedings," pp. 3-32, 3-33. Passive Seismic, Heat Flow (w/Lunar Drill), Cold Cathode Gauge, and Charged Particle Lunar Environment. Passive Seismic, Active Seismic, Suprathermal Ion Detector/Cold Cathode Gauge, and Charged Particle Lunar Environment. Newell requested that both configurations be built but that, if program constraints permitted the fabrication of only one array for ALSEP II and IV, ALSEP III should be given the preference. The Apollo Program Director concurred in the Newell recommendation. Ltr., Apollo Program Director, NASA Hq., to R. O. Piland, MSC, March 29, 1967. The Apollo Site Selection Board meeting at NASA Hq. March 29 heard MSC presentations on lunar landing site selection constraints, results of the Orbiter II screening, and reviews of the tasks for site analysis. MSC made recommendations for specific sites on which to concentrate during the next four months and recommended that the landing sites for the first lunar landing mission be selected by August 1. The Board accepted the recommendations. A Surveyor and Orbiter meeting the following day considered the targeting of the Surveyor C mission and the Lunar Orbiter V mission. MSC representatives at the two meetings were John Eggleston and Owen E. Maynard. Memo, Chief, Mission Operations Div., MSC, to Manager, ASPO, "Trip Report - Apollo Site Selection Board and Surveyor/Orbiter Utilization Committee Meetings," April 20, 1967. H. C. Creighton, A. R. Goldenberg, and Guy N. Witherington, all of KSC, inspected spacecraft 101 wire bundles March 29 at the request of CSM Manager Kenneth S. Kleinknecht of MSC. Kleinknecht had asked that they give him a recommendation as to whether the bundles should be removed or whether they could be repaired in place. On April 4, they reported to Kleinknecht that time had not been sufficient to determine the complete status of the wiring. A superficial inspection about five-percent complete had indicated some serious discrepancies, for which they made some recommendations, but they recommended a more detailed inspection of the spacecraft 101 wire bundles. Memo, Creighton, Goldenberg, and Witherington to Kleinknecht, "Condition of Spacecraft 101 Wire Bundles," April 4, 1967. The Apollo 204 Review Board accepted the report of its Sequence of Events Panel (No. 3), which had been charged with analyzing data from immediately before and during the January 27 fire, including digital, analog, voice communications, and photography. The data was required to display significant events as they occurred with the precise time tag. Time histories of all continuous or semicontinuous recorded parameters and correlation of parameter variations and events were to be recorded, as well as interpretation of the analysis results. Where pertinent, normal expected variations were to be compared with those actually obtained. The data recorded from the spacecraft and ground instrumentation system during the Spacecraft Plugs-Out Test were found to be valid except for three brief dropouts after 6:31:17 EST, January 27 (13 seconds after the pilot reported "fire in the cockpit"). All onboard data transmission ended about 6:31:22 EST. The onboard instrumentation system functioned normally before and during the initial phase of the fire. There were no indicated malfunctions in any of the instrumentation sensors during this period. "Board Proceedings" and Append. D, "Panels 1 thru 4," Report of Apollo 204 Review Board , pp. 3-33 and D-3-3 through D-3-6. The Apollo 204 Review Board met with its Test Procedures Review Panel (Panel No. 7) to complete acceptance of the panel's final report. The panel had been established February 7 to document test procedures actually employed during the day of the January 27 accident and to indicate deviations between planned procedures and those used. The panel was to determine changes that might alleviate fire hazard conditions or that might provide for improved reaction or corrective conditions and review the changes for applicability to other tests. 209 pages of the 275-page Operational Checkout Procedure (OCP) were revised and released on the day before the test. However, less than 25 percent of the line items were changed. Approximately one percent of the change was due to errors in technical content in the original issue of the procedure. In addition, 106 deviations were written during the test. Neither the revision nor the deviations were known to have contributed specifically to the incident. The late timing of the change release, however, prevented test personnel from becoming adequately familiar with the test procedure before use. During the altitude chamber tests, the cabin was pressurized at pressures greater than sea level with an oxygen environment two and a half times as long as the cabin was pressurized with oxygen before the accident during Plugs-Out Test. The spacecraft had successfully operated with the same cabin conditions in the chamber for a greater period of time than on the pad up to the time of the accident. Troubleshooting the communication problem was not controlled by any one person, and was at times independently run from the spacecraft, Launch Complex 34 Blockhouse, and the Manned Spacecraft Operations Building. Communications switching, some of which was not called out in OCP, was performed without the control of the Test Conductor. The uncontrolled troubleshooting and switching contributed to the difficulty experienced in attempting to assess the communication problem. KSC was not able to ensure that the spacecraft launch operations plans and procedures adequately satisfied, in a timely way, the intent of MSC. Changes in spacecraft testing by KSC could not be kept in phase with the latest requirements of MSC. Prelaunch checkout requirements were not formally transmitted to KSC from MSC. Prelaunch-test-requirements control for the Apollo spacecraft program was constrained by slow response to changes, lack of detailed KSC-MSC inter-Center agreements, and lack of official NASA-approved test specifications applicable to prelaunch checkout. The decision to perform the Plugs-Out Test with the flight crew, closed hatch, and pure oxygen cabin environment made on October 31, 1966, was a significant change in test philosophy. There was no evidence that this change in test philosophy was made so late as to preclude timely incorporation into the test procedure. "Board Proceedings" and Append. D, "Panels 6 thru 10," Report of Apollo 204 Review Board , pp. 3-33 and D-7-3 through D-7-13. The Apollo 204 Review Board was scheduled to review the final report of its Historical Data Panel (Panel No. 6). The panel had been assigned to assemble, summarize, and interpret historical data concerning the spacecraft and associated systems pertinent to the January 27 fire. The data were to include such records as the spacecraft log, failure reports, and other quality engineering and inspection documents. In addition the panel prepared narratives to reflect the relationship and flow of significant review and acceptance points and substantiating documentation and presented a brief history of prelaunch operations performed on spacecraft 012 at Kennedy Space Center. The Ingress-Egress Log disclosed several instances where tools and equipment were carried into the spacecraft, but the log did not indicate these items had been removed. Maintenance of the Ingress-Egress Log was inadequate. Inspection personnel did not perform a prescheduled inspection with a checklist before hatch closing. Inspection personnel could not verify specific functions during that period. At the time of the spacecraft 012 shipment to KSC, the contractor submitted an incomplete list of open items. A revision of that list significantly and substantially enlarged the list of open items. The true status of the spacecraft was not identified by the contractor. "Board Proceedings" and Append. D, "Panels 6 thru 10," Report of Apollo 204 Review Board , pp. 3-33 and D-6-3 through D-6-7. The Apollo 204 Review Board accepted the final report of its Design Review Panel (No.9), whose duty had been to conduct Critical Design Reviews of systems or subsystems that might be potential ignition sources within the Apollo command module cockpit or that might provide a combustible condition in either normal or failed conditions. The panel was also to consider areas such as the glycol plumbing configuration; electrical wiring and its protection, physical and electrical; and such potential ignition sources as motors, relays, and corona discharge. Other areas would include egress augmentation and the basic cabin atmosphere concept (one-gas versus two-gas). The contemplated spacecraft configuration for the next scheduled manned flight (spacecraft 101, Block II) was significantly different from that of spacecraft 012 (Block I), in which the January 27 fire had occurred. Therefore, both configurations were to be reviewed - the Block I configuration as an aid in determining possible sources for the fire, the Block II to evaluate the system design characteristics and potential design change requirements to prevent recurrence of fire. Flammable, nonmetallic materials were used throughout the spacecraft. In the Block I and Block II spacecraft design, combustible materials were contiguous to potential ignition sources. In the Block I and Block II spacecraft design, combustible materials were exposed in sufficient quantities to constitute a fire hazard. The spacesuit contained power wiring to electronic circuits. The astronauts could be electrically insulated. Both the power wiring and potential for static discharge constituted possible ignition sources in the presence of combustible materials. The wiring in the suit could fail from working or bending. Residues of RS89 (inhibited ethylene glycol/water solution) after drying were both corrosive and combustible. RS89 was corrosive to wire bundles because of its inhibitor. Because of the corrosive and combustible properties of the residues, RS89 coolant could, in itself, provide all of the elements of a fire hazard if it leaked onto electrical equipment. Water/glycol was combustible, although not easily ignited. Leakage of water/glycol in the cabin would increase risk of fire. Deficiencies in design, manufacture, and quality control were found in the postfire inspection of the wire installation. There was an undesirable risk exposure, which should have been prevented by both the contractor and the government. The spacecraft atmosphere control system design was based on providing a pure oxygen environment. The technology was so complex that, to provide diluent gases, duplication of the atmosphere control components as well as addition of a mechanism for oxygen partial-pressure control would be required. These additions would introduce additional crew-safety failure modes into the flight systems. Sixty seconds were required for unaided crew egress from the CM. The hatch could not be opened with positive cabin pressure above approximately 0.17 newtons per sq cm (0.25 psi). The vent capacity was insufficient to accommodate the pressure buildup in the Apollo 204 spacecraft. Even under optimum conditions emergency crew egress from Apollo 204 spacecraft could not have been accomplished in sufficient time. During the January 27 Apollo 204 test, difficulty was experienced in communicating from ground to spacecraft and among ground stations. The ground system design was not compatible with operational requirements. "Board Proceedings" and Append. D, "Panels 6 thru 10," Report of Apollo 204 Review Board , pp. 3-33 and D-9-3 through 3-9-13. Several arcing indications were observed in the CM left front sector and a voltage transient was noted in all three phases of AC Bus 2. This transient was most closely simulated by a power interruption or short circuit on DC Bus B. Physical evidence and witness statements indicated the progress of the fire to be from the left side of the spacecraft. Simulations and tests indicated that combustion initiation by electrostatic discharge or chemical action was not probable. No physical evidence of prefire overheating of mechanical components or heating devices was found. No single ignition source could be conclusively identified. The most probable initiator was considered to be the electrical arcing or shorting in the left front sector of the spacecraft. The location best fitting the total available information was that where environmental control system instrumentation power wiring ran into the area between the environmental control unit and the oxygen panel. All spacecraft records were reviewed by the various panels and the results were screened by Panel 18. No evidence was found to correlate previously known discrepancies, malfunctions, qualification failures or open work items with the source of ignition. At the time of the observed fire, data including telemetry and voice communications indicated no malfunctioning spacecraft systems (other than the live microphone). Existing spacecraft instrumentation was insufficient by itself to provide data to identify the source of ignition. "Board Proceedings" and Append. D, "Panel 18," Report of Apollo 204 Review Board , pp. 3-33 and D-18-3 through D-18-51. The final report of the Medical Analysis Panel (No. 11) to the Apollo 204 Review Board was processed for printing. The panel had been assigned to provide a summary of medical facts with appropriate medical analysis for investigation of the January 27 fire. Examples were cause of death, pathological evidence of overpressure, and any other areas of technical value in determining the cause of accident or in establishing corrective action. The panel report indicated that at the time of the accident two NASA physicians were in the blockhouse monitoring data from the senior pilot. Upon hearing the first voice transmission indicating fire, the senior NASA physician turned from the biomedical console to look at the bank of television monitors. When his attention returned to the console the bioinstrumentation data had stopped. The biomedical engineer in the Acceptance Checkout Equipment (ACE) Control Room called the senior medical officer for instructions. He was told to make the necessary alarms and informed that the senior medical officer was leaving his console. The two NASA physicians left the blockhouse for the base of the umbilical tower and arrived there shortly before ambulances and a Pan American physician arrived at 6:43 p.m. The three physicians went to the spacecraft; time of their arrival at the White Room was estimated to be 6:45 p.m. EST. By this time some 12 to 15 minutes had elapsed since the fire began. After a quick evaluation it was evident that the crew had not survived the heat, smoke, and burns and it was decided that nothing could be gained by attempting immediate egress and resuscitation. Biomedical data at the time of the accident were received from only the senior pilot. The data consisted of one lead of electrocardiogram, one lead of phonocardiogram, and impedance pneumogram (respiration). The data was received by telemetry and from the onboard medical data acquisition system. This configuration was normal for the test. At 6:31:04 p.m. there was a marked change in the senior pilot's respiratory and heart rates on the biomedical tape. There was also evidence of muscle activity in the electrocardiogram and evidence of motion in the phonocardiogram. The heart rate continued to climb until loss of signal. This physiological response is compatible with the realization of an emergency situation. At least one crew member was conscious until that time. Hatches were opened at approximately 6:36 p.m. and no signs of life were detected. Three physicians looked at the suited bodies at approximately 6:45 p.m. and decided that resuscitation efforts would be to no avail. Time of death could not be determined from this finding. "The cause of death of the Apollo 204 Crew was asphyxia due to inhalation of toxic gases due to fire. Contributory cause of death was thermal burns." It could be concluded that death occurred rapidly and that unconsciousness preceded death by some increment of time. The fact that an equilibrium had not been established throughout the circulatory system indicated that blood circulation stopped rather abruptly before an equilibrium could be reached. Panel 5 had estimated that significant levels (more than two percent) of carbon monoxide were in the spacecraft atmosphere by 6:31:30 p.m. EST. By this time at least one spacesuit had failed, introducing cabin gases to all suit loops. The crew was exposed to a lethal atmosphere when the first suit was breached. The distribution of carbon monoxide in body organs indicated that circulation stopped rather abruptly when high levels of carboxyhemoglobin reached the heart. Loss of consciousness was caused by cerebral hypoxia due to cardiac arrest from myocardial hypoxia. Factors of temperature, pressure, and environmental concentrations of carbon monoxide, carbon dioxide, oxygen, and pulmonary irritants were changing at extremely rapid rates. It was impossible from available information to integrate these variables with the dynamic physiological and metabolic conditions they produced, to arrive at a precise statement of the time when consciousness was lost and when death supervened. Loss of consciousness was estimated as at between 15 and 30 seconds after the first suit failed. Chances of resuscitation decreased rapidly thereafter and were irrevocably lost within 4 minutes. The purge with 100-percent oxygen at above sea-level pressure contributed to the propagation of fire in the Apollo 204 spacecraft. The oxygen level was the planned cabin environment for testing and launch, since prelaunch denitrogenation was necessary to forestall the possibility of the astronauts' suffering the bends. A comprehensive review of operational and physiological tradeoffs of various methods of denitrogenation was in progress. "Board Proceedings" and Append. D, "Panel 11," Report of Apollo 204 Review Board , pp. 333 and D-11-3 through D-11-9. ASPO Manager Joseph F. Shea requested that the White Sands Test Facility be authorized to conduct the descent propulsion system series tests starting April 3 and ending about May 1. The maximum expected test pressure would be 174 newtons per sq cm (253 psia), normal maximum operating pressure. The pressure could go as high as 179 newtons per sq cm (260 psia) according to the test to be conducted. Required leak check operations were also requested at a maximum pressure of 142 newtons per sq cm (206 psia), with a design limit of 186 newtons per sq cm (270 psia). The test fluids would be compatible with the titanium alloy at the test pressures. The test would be conducted in the Altitude Test Stand, where adequate protection existed for isolating and containing a failure. MSC Director Robert R. Gilruth approved the request the same day. Memo, Shea to Gilruth, "Request for authorization to conduct a pressure test," March 31, 1967. In reply to a request from NASA Hq., CSM Manager Kenneth S. Kleinknecht told Apollo Program Director Samuel C. Phillips that replacement of the service module 017 oxidizer tank was based on a double repair weld of the method 2 kind in that tank. This kind of repair, he said, resulted in a weld chemistry similar to the weld on the S-IVB helium bottle that had failed, as had only recently been determined by examination of the secondary-propulsion-system tank repair weld. There was insufficient proof that titanium hydride concentrations could not occur in the double method-2 repair weld, and replacement of the tank would preclude any question as to the integrity of the tank. The decision was delayed as long as possible in the hope of developing technical justification of weld integrity. When that was not achieved and there was little confidence that justification could be developed in the near future, the decision was made directing the tank change. The activity would not cause additional schedule time loss, as it was already necessary to repeat the spacecraft integrated test because of wiring rework. Ltr., Kleinknecht to Phillips, "Delay in Direction to Effect Service Module Tank Change," April 1, 1967. The mission profile for the first manned Apollo flight would be based on that specified in Appendix AS-204 in the Apollo Flight Mission Assignments Document dated November 1966, the three manned space flight Centers were informed. Apollo Program Director Samuel C. Phillips said the complexity of the mission was to be limited to that previously planned, and therefore consideration of a rendezvous exercise would be dependent upon the degree of complication imposed on the mission. "There will be no additions that require major new commitments such as opening a CM hatch in space or exercising the docking subsystem." TWX, Phillips to MSC, MSFC, and KSC, "First Manned Mission," April 5, 1967. The Apollo 204 Review Board transmitted its final formal report to NASA Administrator James E. Webb, each member concurring in each of the findings, determinations, and recommendations concerning the January 27 spacecraft fire that took the lives of three astronauts. The Apollo 204 Review Board studied Apollo spacecraft 014 (above) in its investigation of the January 27, 1967, fire in the similar CM 012 (below, photographed after the fire). The interior view shows the forward section of the left-hand equipment bay, below the environmental control unit in each spacecraft. The DC power cable crosses over aluminum tubing and under a lithium hydroxide access door (removed in the photo of the damaged CM 012). The board determined this was the area of the most probable initiator of the fire. During the review the Board had adhered to the principle that reliability of the CM and the entire system involved in its operation was a requirement common to both safety and mission success. Once the CM had left the earth's environment the occupants were totally dependent on it for their safety. It followed that protection from fire as a hazard required much more than quick egress. Egress was useful only during test periods on earth when the CM was being readied for its mission and not during the mission itself. The risk of fire had to be faced, but that risk was only one factor pertaining to CM reliability that must receive adequate consideration. Design features and operating procedures intended to reduce the fire risk must not introduce other serious risks to mission success and safety. The House Committee on Science and Astronautics' Subcommittee on NASA Oversight held hearings on the Review Board report April 10-12, 17, and 21 and May 10. Senate Committee on Aeronautical and Space Sciences hearings were held April 11, 13,and 17 and May 4 and 9 (see May 9-10, 1967, and Appendix 8). A momentary power failure occurred at 6:30:55 p.m. EST (23:30:55 GMT). Evidence of several arcs was found in the postfire investigation. The most probable initiator was an electrical arc in the sector between the -Y and +Z spacecraft axes. The exact location best fitting the total available information was near the floor in the lower forward section of the left-hand equipment bay where environmental control system instrumentation power wiring led into the area between the environmental control unit and the oxygen panel. No evidence was discovered that suggested sabotage. The CM contained many classes of combustible material in areas contiguous to possible ignition sources. The test was conducted with a 100-percent oxygen atmosphere at 11.5 newtons per sq cm (16.7 psia). The amount and location of combustible materials in the CM must be severely restricted and controlled. The rapid spread of fire increased pressure and temperature, rupturing the CM and creating a toxic atmosphere. "Death of the crew was from asphyxia due to inhalation of toxic gases due to fire. A contributory cause of death was thermal burns." Autopsy data led to the medical opinion that unconsciousness occurred rapidly and that death followed soon thereafter. Because of internal pressure, the CM inner hatch could not be opened before rupture of the CM. The crew was never capable of effecting emergency egress because of the pressurization before the rupture and their loss of consciousness soon after rupture. The time required for egress of the crew should be reduced and the operations necessary for egress be simplified. The organizations responsible for planning, conducting, and safety of this test failed to identify it as being hazardous. Contingency preparations to permit escape or rescue of the crew from an internal CM fire were not made. No procedures for this kind of emergency had been established either for the crew or for the spacecraft pad work team. The emergency equipment in the White Room and on the spacecraft work levels was not designed for the smoke condition resulting from a fire of this nature. Emergency fire, rescue, and medical teams were not in attendance. Both the spacecraft work levels and the umbilical tower access arm contained features such as steps, sliding doors, and sharp turns in the egress paths which hindered emergency operations. Management should continually monitor the safety of all test operations and ensure the adequacy of emergency procedures. All emergency equipment (breathing apparatus, protective clothing, deluge systems, access arm, etc.) should be reviewed for adequacy. Personnel training and practice for emergency procedures should be given regularly and reviewed before a hazardous operation. Service structures and umbilical towers should be modified to facilitate emergency operations. The ground communication system should be improved to ensure reliable communications among all test elements as. soon as possible and before the next manned flight. A detailed design review should be conducted on the entire spacecraft communication system. Revisions in the Operational Checkout Procedure for the test were issued at 5:30 p.m. EST January 26, 1967 (209 pages), and 10:00 a.m. EST January 27, 1967 (4 pages). Differences existed between the ground test procedures and the inflight checklists. Neither the revision nor the differences contributed to the accident. The late issuance of the revision, however, prevented test personnel from becoming adequately familiar with the test procedure before use. Test procedures and pilot's checklists that represent the actual CM configuration should be published in final form and reviewed early enough to permit adequate preparation and participation of all test organizations. Timely distribution of test procedures and major changes should be made a constraint to the beginning of any test. The fire in CM 012 was subsequently simulated closely by a test fire in a full-scale mockup. Full-scale mockup fire tests could be used to give a realistic appraisal of fire risks in flight-configured spacecraft. Full-scale mockups in flight configuration should be tested to determine the risk of fire. The CM environmental control system design provided a pure oxygen atmosphere. This atmosphere presented severe fire hazards if the mount and location of combustibles in the CM were not restricted and controlled. The fire safety of the reconfigured CM should be established by full-scale mockup tests. Studies of the use of a diluent gas should be continued, with particular reference to assessing the problems of gas detection and control and the risk of additional operations that would be required in the use of a two-gas atmosphere. Components of the environmental control system installed in CM 012 had a history of many removals and of technical difficulties, including regulator failures, line failures, and environmental control unit failures. The design and installation features of the environmental control unit made removal or repair difficult. Coolant leakage at solder joints had been a chronic problem. The coolant was both corrosive and combustible. Deficiencies in design, manufacture, installation, rework, and quality control existed in the electrical wiring. Spacecraft design and operating procedures required the disconnecting of electrical connections while powered. All elements, components, and assemblies of the environmental control system should be reviewed in depth to ensure its functional and structural integrity and to minimize its contribution to fire risk. The design of soldered joints in the plumbing should be modified to increase integrity or the joints should be replaced with a more structurally reliable configuration. Deleterious effects of coolant leakage and spillage should be eliminated. Specifications should be reviewed; three-dimensional jigs should be used in manufacture of wire bundles; and rigid inspection at all stages of wiring design, manufacture, and installation should be enforced. Flight-configured spacecraft should be vibrationtested. The necessity for electrical connections or disconnections with power on within the crew compartment should be eliminated. The most effective means of controlling and extinguishing a spacecraft fire should be investigated. Auxiliary breathing oxygen and crew protection from smoke and toxic fumes should be provided. The number of open items at the time of shipment of the CM 012 was not known. There were 113 significant engineering orders not accomplished at the time CM 012 was delivered to NASA; 623 engineering orders were released subsequent to delivery. Of these, 22 were recent releases that were not recorded in configuration records at the time of the accident. Established requirements were not followed with regard to the pretest constraints list. The list was not completed and signed by designated contractor and NASA personnel before the test, even though oral agreement to proceed was reached. Formulation of and changes in prelaunch test requirements for the Apollo spacecraft program were responsive to changing conditions. Noncertified equipment items were installed in the CM at time of test. The test specification was released August 1966 and was not updated to include accumulated changes from release date to the January 27 test date. Problems of program management and relations between Centers and with the contractor had led to some insufficient responses to changing program requirements. Every effort must be made to ensure the maximum clarification and understanding of the responsibilities of all organizations in the program, the objective being a fully coordinated and efficient program. Report of Apollo 204 Review Board to the Administrator, National Aeronautics and Space Administration , April 5, 1967, transmittal letter and pp. 6-1 through 6-3 ; House Committee on Science and Astronautics, Subcommittee on NASA Oversight, Investigation into Apollo 204 Accident: Hearings , 90th Cong., 1st sess., vols. 1-3, April 10, 11, 17, 21, May 10, 1967; Senate Committee on Aeronautical and Space Sciences, Apollo Accident: Hearings , 90th Cong., 1st sess., pts. 3-7, April 11, 13, and 17, May 4 and 9, 1967.